We are well equipped to create custom windows in just about any shape, size, and color combination. Contact your dealer or look below and explore some of our creative options. To meet todays high style of architectural design we offer custom colors and finishes. Richlin's quality windows also come in quarter-rounds, half-rounds, pentoids, trapezoids, ellipticals and others. 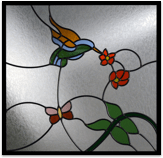 Beautify your home with art glass. Many custom sizes and designs available. Between the glass blinds eliminate wear and tear from pets or young children while keeping your family safe from traditional cords.